June 2012, Nearby Ramallah, West Bank. Advertising for a lottery in a Gas station, with a car as a first prize, suburb of Ramallah. Every time they spend 50 Shekel in the gas station, the customers get a ticket for the lottery. 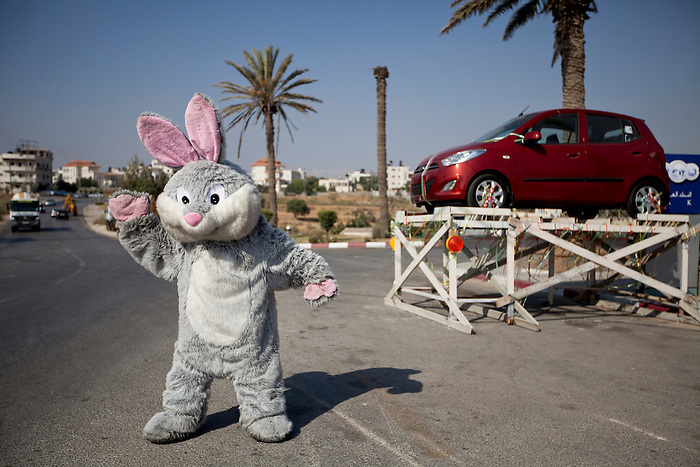 In the Rabbit costume, a child of 14 years old is sweating to attract the clients. Ziyad Taleb, the owner of the gas station and 1948 refugee, discovered this marketing technique in Thailand during a holiday trip, and found the idea very clever.